and the door swings in two directions. 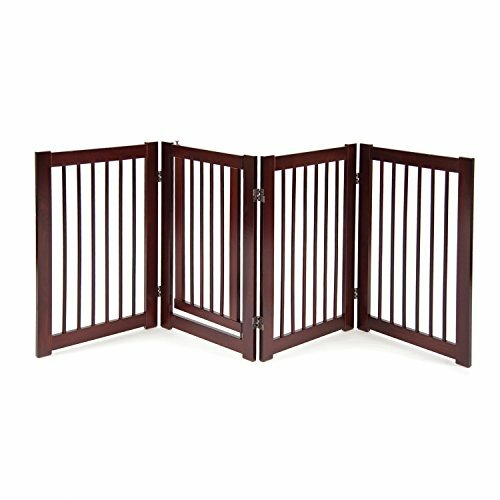 SPECIFICATIONS: 4-panel wood dog gate with rich walnut finish and two-way swing door stands 30" tall and spans openings up to 72". FLEXIBLE CONFIGURATION: Hinges rotate 360º for unlimited configurations. Use as a gate at bottom of stairs, in doorways or in any other indoor location or make a self-contained stand-alone dog pen. Spans wide openings. SAFE & SECURE: Rubber pads keep gate from sliding and protect floors from scratches. Door locks securely in place with spring-loaded bolt. One-handed latch for easy access. EASY TO MOVE & STORE: Lightweight and easy to move. 360º hinges allow gate to fold for convenient storage. CUSTOMIZE WITH ACCESSORIES: Create the perfect gate system to meet your needs with optional support feet and wall-mount kits for additional stability and extension kits to span extra wide openings. QUALITY & VALUE: Primetime Petz has been a trusted name in top-quality pet furniture since 2008. We stand behind our products and want you to be completely satisfied with your purchase. If you have any questions about this product by Primetime Petz, contact us by completing and submitting the form below. If you are looking for a specif part number, please include it with your message.